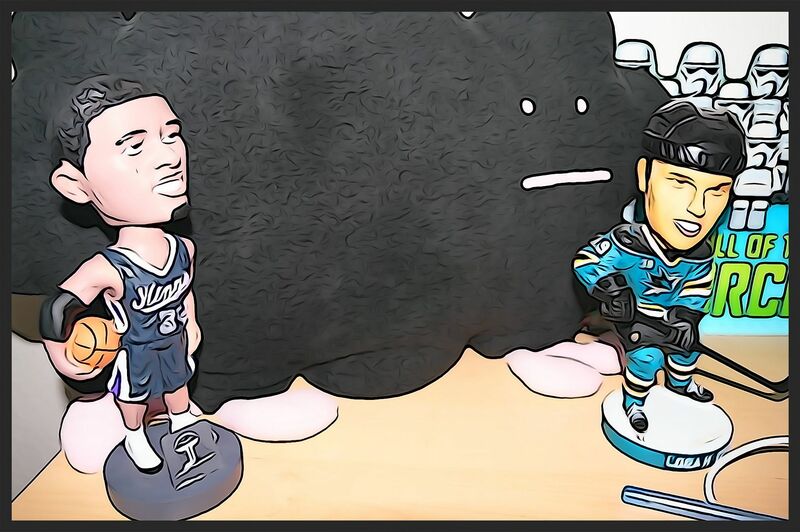 Artifacts is the first 'serious' hockey product of the year. This hit-filled product has always been a collector favorite. Each hobby box comes with an autograph and a handful of memorabilia cards. For about a hundred dollars, it is a product that many box breakers can afford to bust. Artifacts looks to be as solid as it has always been yet again. To me, the Artifacts base cards have always been great looking premium cards. This year's iteration continues to impress. 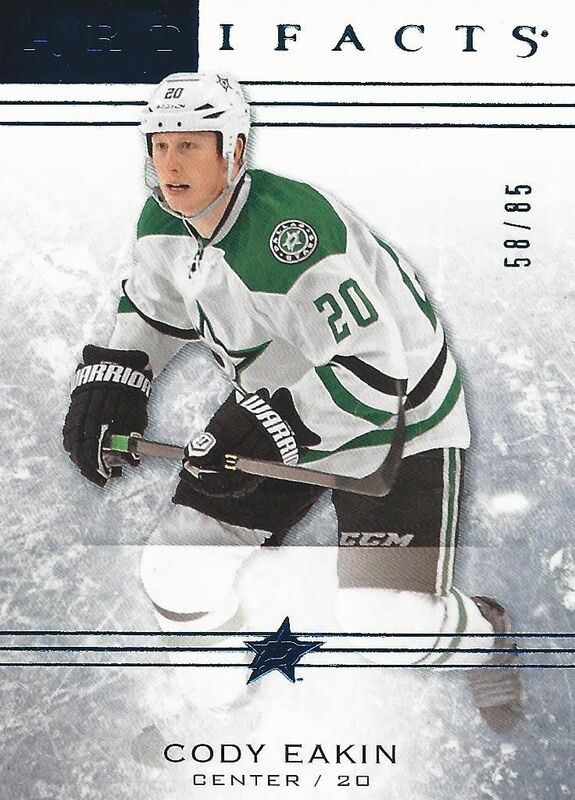 Each base card has a primarily white ice-like background that fits perfectly with hockey. The foil and graphics used are elegantly done and tasteful. Nothing looks out of place or distracts. Visually, the cards are modern, clean, and beautiful to look at. Upper Deck has also chosen to be a bit creative again with their player photo selection. 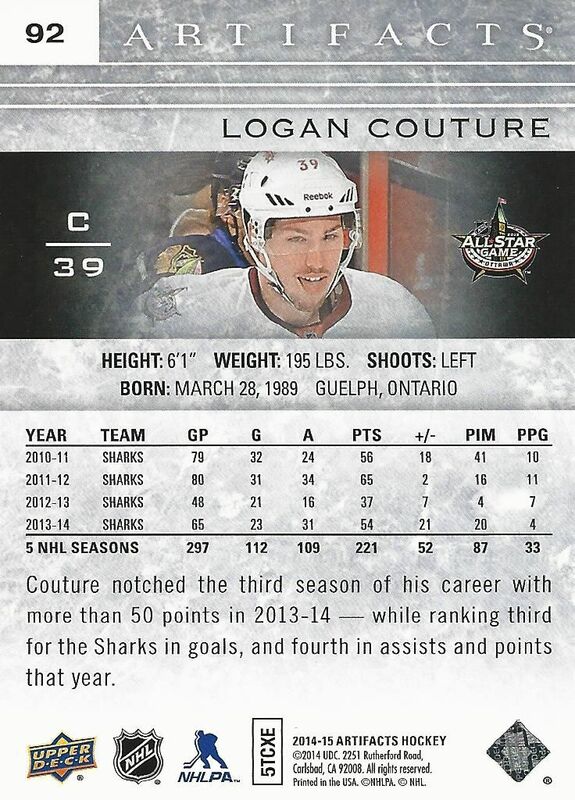 You'll see players in their All-Star jersey's like Logan Couture above as well other cards of retired greats and current stars.. It's a pretty big mish-mosh of images that gives the set a nice variety of player photos to look at. The back design compliments the front of the card very well. A similar ice background is used as well as familiar design elements. The backs are full color and feature both stats and a short write-up. The picture used on the back is the same one used on the front. It's not a bad thing, but sometimes companies will really go for it and use different photos on the back. 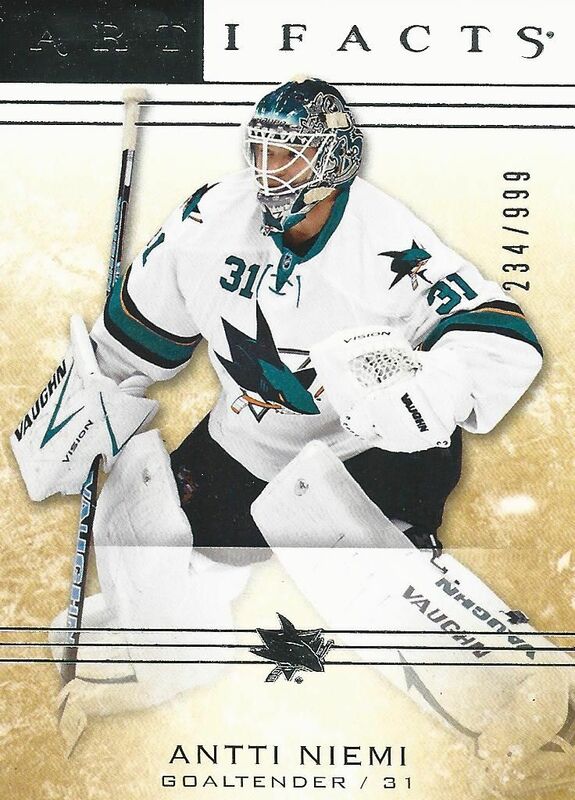 Back this year are the serial numbered goalie base cards. Each card is numbered to 999 and has a golden-ice background look. Other than the golden hue and numbering, these cards are the same as their base card counterparts. You will find about one of these per box. Last year Upper Deck also inserted Team Canada serial numbered cards. Those cards are not to be found this year. Rookie cards finish off the Artifacts base set. They too have serial numbering and a special color - blue. Added to these cards is a special 'Rookie' notation above the team logo. The logo is pretty large and a bit distracting for my tastes, but overall the card has a pleasing design, and it's easy to tell them apart from the standard base cards and goalie cards. I find it funny that the box states that it is 'chock full of hits!'. Each box will have at least 3 memorabilia cards and one autographed card. At least one of the memorabilia cards will be of a combination of players. Packs without autos or memorabilia will have either serial numbered cards or a rookie redemption in them. 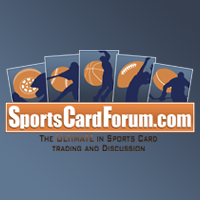 Besides memorabilia, Artifacts is known for its numerous parallel cards. You'll find short printed base variations as well as variations of cards with autographs or memorabilia on them. Collectors who enjoy the chase of finding a complete rainbow will definitely have their work cut out for them with Artifacts. Shown above is a standard base card parallel with blue foil numbered to 85. 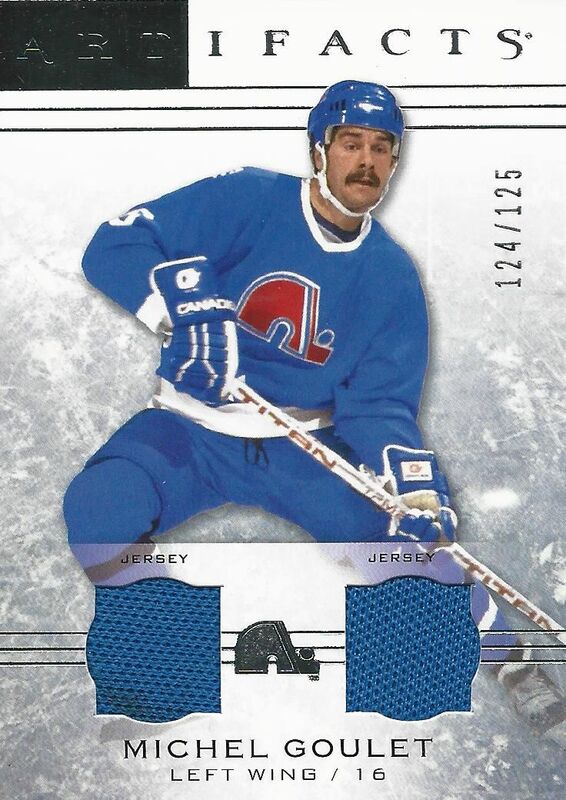 Dual jersey memorabilia cards like the Michel Goulet card I pulled are a staple of Artifacts. These are very prevalent when opening packs of the product. More premium version of these cards will have patches and autographs included on the card with serial numbering much less than 125. 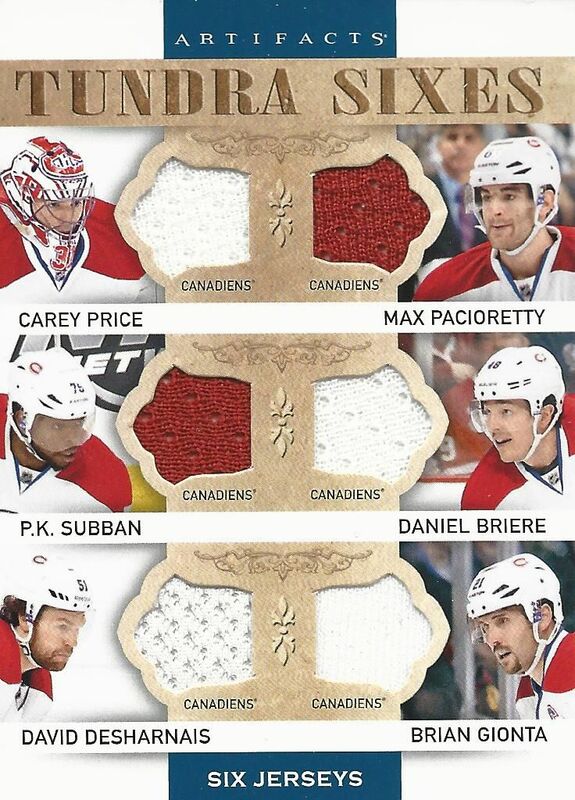 Here's a Tundra Sixes card of the Montreal Canadiens. The jersey pieces are pretty small, but the size worked out well to fit all six of them and a player photo on the front of the card. I prefer to have everything on one-side rather than having to flip the card around to see the rest of the memorabilia. I was very surprised to find two Tundra Sixes in my box of Artifacts! Instead of having just one team like the Canadiens card, this one has three Islanders and three Devils in sort of a versus matchup. I do like the variety of colors found on this particular card. Auto Facts sticker autographs are the typical autographed card in Artifacts. If you don't find an Auto Facts, you'll probably have an autograph combined with memorabilia on a parallel card. 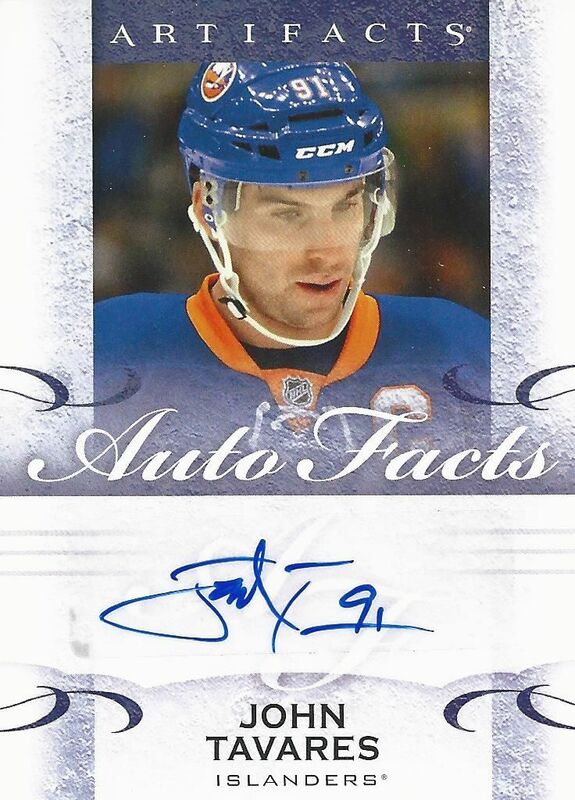 Typically it is difficult to find Auto Facts cards of the bigger named players. I was pretty happy when John Tavares came out of a pack from my box. Rounding out my box was this Wild Card Rookie Redemption. 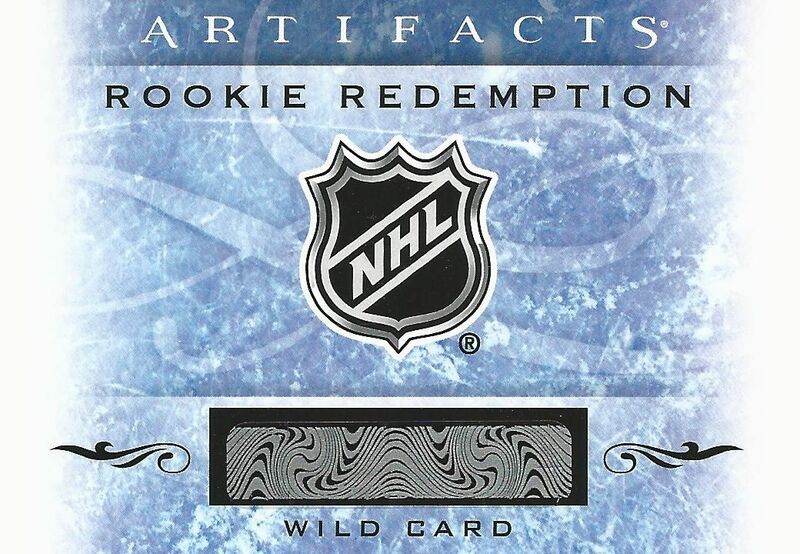 Each team has rookie redemption cards, and overflow players will be randomly slotted for these Wild Cards. Collectors will have to be patient as these rookie cards won't be available for quite a while. Artifacts is a product that has so many hit types. Opening just one box will not allow you to really see how much is put into the product. Tags, sticks, and fight straps all make appearances this year. Also, the Autographed Rookie Redemption cards have returned once again. Those cards have always been a popular pull with box breakers. Artifacts has shown me once again that it is a worthy first product for serious collectors. It comes in a small footprint of ten packs, but as the box says... it's chock full of hits! I've always had fun opening boxes of Artifacts, and this year looks to provide more of the same enjoyment. The box I opened today was especially good, but don't expect all boxes to be like this. Tundra Sixes don't come out that often! Truth be told, the shop owner opened up a box after I did and it did not impress. It had all the required hits, but the player selection was not there. You win some and you lose some... that definitely still applies! But all-in-all, Artifacts looks to be strong once again and I can definitely recommend it for purchase. I'm glad it's out because now we have some really rare and beautiful cards to chase down and find! Great box man, might buy one too. I really like the desgin of Artifacts this year!! 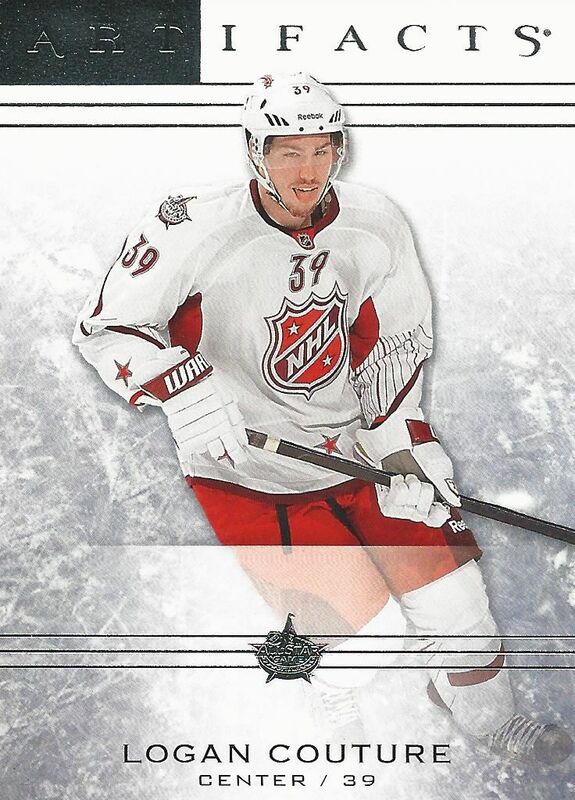 I really like the Tundra Sixes card of Montreal Canadians! Nice review! I will keep my eye out for this product. GOULET!! Great break. Way to go with this review! They put some really good detail and design in the cards! Love how this set is looking, I'd love to pull a tag or a stick. 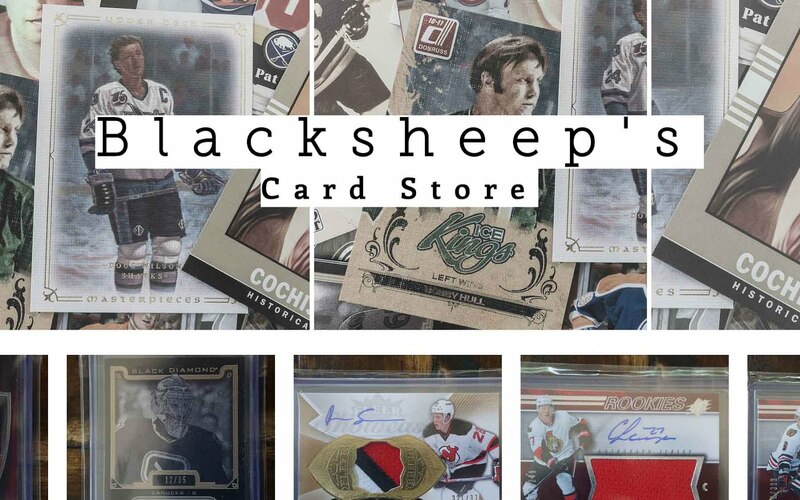 As always, Upper Deck are coming with another solid product ! Can't wait to see series 1 and 2 !!! I might buy some Artifacts this year. The base card design looks great and you get a hit a pack (well let's say 1:2). Nice box break! + You can get some great low-numbered cards. + The base cards lokks oretty good as always. 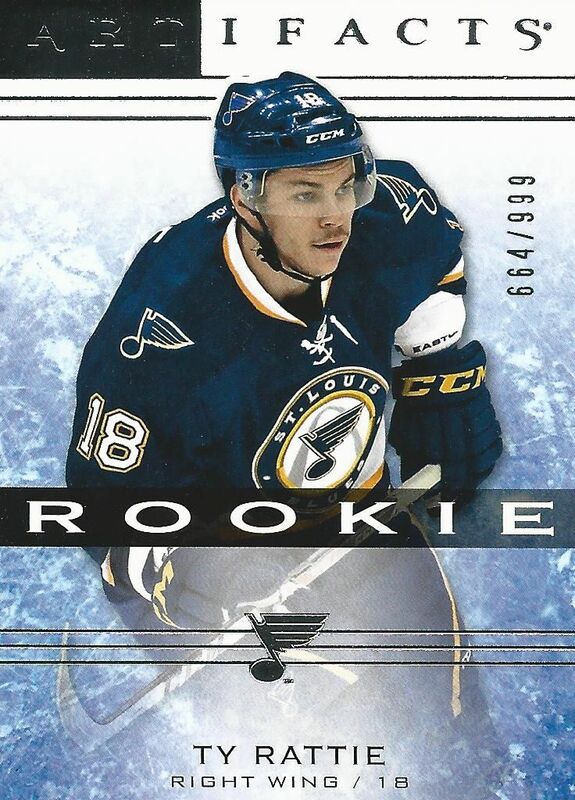 - The 'rookie' logo on the rookie cards. - The fact that the box states that it's "chock full of hits". You got a pretty solid box. Hits to me are designed like all artifacts hits are. One thing i really like this year is the base design. might just have to buy one of these boxes. They really stepped up their game with the hits. The swatches one the 6 way are a bit small but its worth it for the hits you receive. This years autofacts look great, gongrats on the JT auto. Thanks for the video and review. The card looks very good and you have a very great box! You got an amazing box. Love the product and the review. Nice review like always! Got a decent amount of hits and nice Goulet! 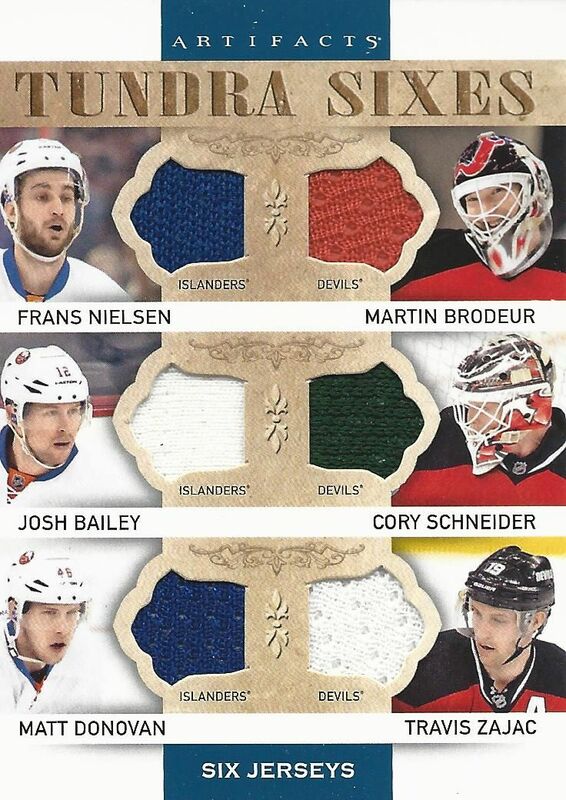 Nice break with those Six way jersey cards ! i wondering what the blaster r going to be like . Really liking the base card design this year! Keep up the good work. As always Artifacts does seem to deliver the same each and every year, but this year I have realized the boxes are a little more loaded than previous years. I still don't like the fact that some jersey cards aren't numbered. Great video and good box! I really like the Tavares and the Tundra Sixes! Keep up the great video!